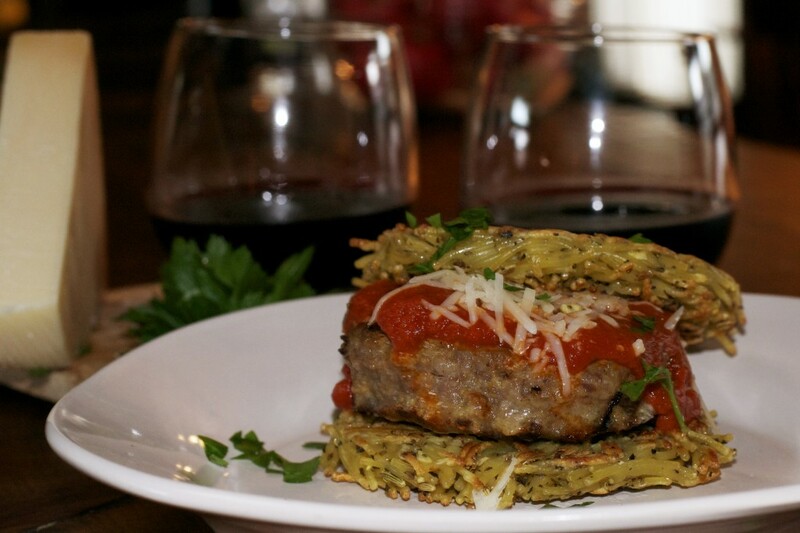 Italian Spaghetti-Meatball Burger-What the"Forks" for Dinner? There are no words or pictures that can describe how truly awesome this Italian Spaghetti and Meatball Burger is………but of course we will try! I was home one day and I was watching “The Chew”. The show that day was about burgers. They did all different kinds of recipes for burgers , but the one that caught my eye was for a spaghetti burger. They went to a place called PYT’s in Philadelphia, where the burger originated. It looked really good and not to hard to make. Like all things that catch your eye sometimes it’s just a flash in the pan and you don’t think about it again. I just could not get this burger out of my mind. I kept telling Tim that I really wanted to make it. After some repeated discussion, and after Tim’s suggestion that we make the burger out of Italian sausage we began the Italian Spaghetti and Meatball Burger. The burger part is fairly straight forward. Italian sausage, seasonings, egg, panko crumbs, mix, shape into eight patties then a little surprise in the center…….mini mozzarella balls, smush them down a little bit, otherwise it looks a little funny……lol. Top with another patty and seal the edges. and grill or pan fry. The bun is a different story. PTY’s will not give the secret for how they shape the burgers. So, I improvised. If you have seen the Ramen Noodle Burger…..the one that the bun is made from ramen noodles, they use ramekins and place a can on top for weight. That was originally my plan for these burgers. But, at the grocery store there was a clearance rack……..by the way, I am a sucker for clearance or sale items……Tim is nodding ……….It was grill stuff, and I spied a burger press… if you can press a burger why not the bun…..made of spaghetti. Seemed easier than 8 ramekins. All I can say is, if you have one or can get one, the burger press is perfect for this recipe. If not the ramekins will work too. At PTY’s they bake their buns but, I used a flat skillet sprayed with coconut oil. Worked like a charm. They are crispy on the outside and chewy inside. I must say using the spaghetti as a bun was a a stroke of genius that I would not have thought of, but I am glad PTY’s did! To say this burgers exceeded expectations is an understatement! They were like a big plate of spaghetti and meatballs….only better….way better! There is a line in the movie Pulp Fiction when Samuel L. Jackson takes a bite from a burger of a guy he is about to shoot, and he says ” thats a tasty “forking” (our word) burger…….. 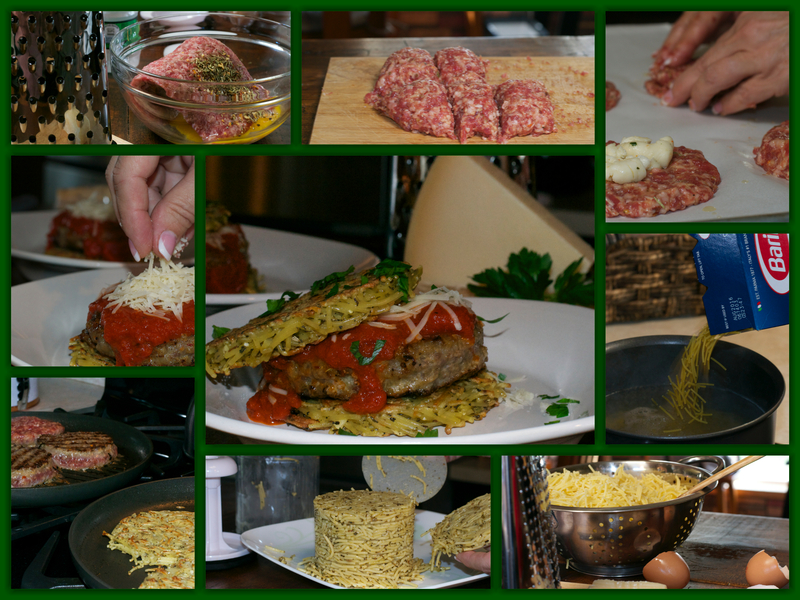 In the case of the Italian Spaghetti and Meatball Burger we think that is true! sure the pasta is completely drained (excess water can affect the formation of the bun). Spread pasta on a parchment lined cookie sheet to help cool. Once pasta is cooled and dry, combine it with the eggs, oregano, basil, garlic, salt and pepper in a bowl. Portion the pasta mixture into 8 equal parts (about 2 ounces each). 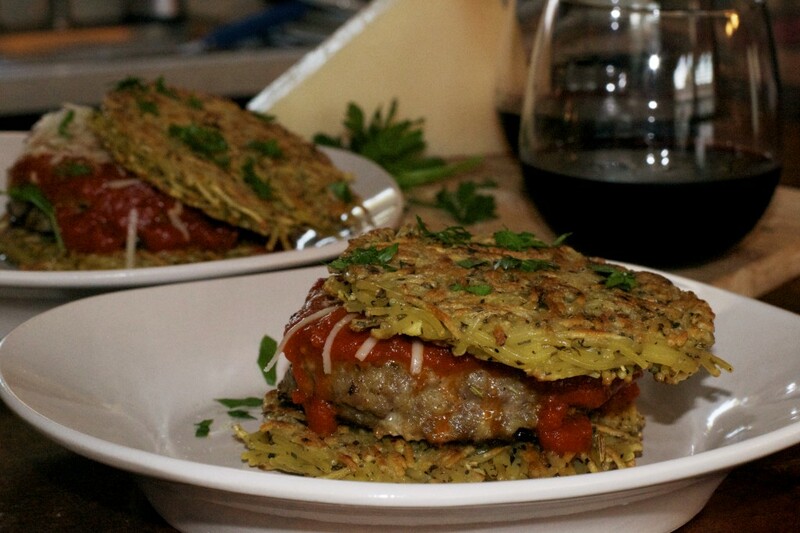 Form the pasta into patties. I used a burger press, but you can also spray ramekin cups, spray with cooking spray, place pasta mixture in cup and cover with plastic wrap. Using cans from your cupboard, place one can on each covered ramekin ( the weight of the can will compress the pasta). Once patties have been formed, refrigerate for an hour or until firm. To cook you can either lay the firm spaghetti buns on a well greased pan and bake at 350F for about 20 minutes, or until golden brown on the outer edge but with a firm bite in the center. Or you can cook them on a flat griddle or skillet sprayed with cooking spray, over medium high heat until golden brown. Combine the egg, panko crumbs, salt, pepper, herbs, garlic and parmesan cheese with the Italian sausage. Separate the ground beef mixture into 8 equal portions (about 2.5 ounces each). Press each portions out evenly into a patty shape, making sure there are no tears in the meat. Lay out all the pressed patties on a sheet tray and place 2 of the mini mozzarella balls (slightly squeezed so they lay flat) in the center of four of the patties. Using the remaining patties, cover each cheese topped patty so the cheese remains in the center. Pinch together the edges of the patties to seal in the cheese. Place in refrigerator until ready to cook. Cook the stuffed meatball patties medium well to ensure that the cheese has melted. 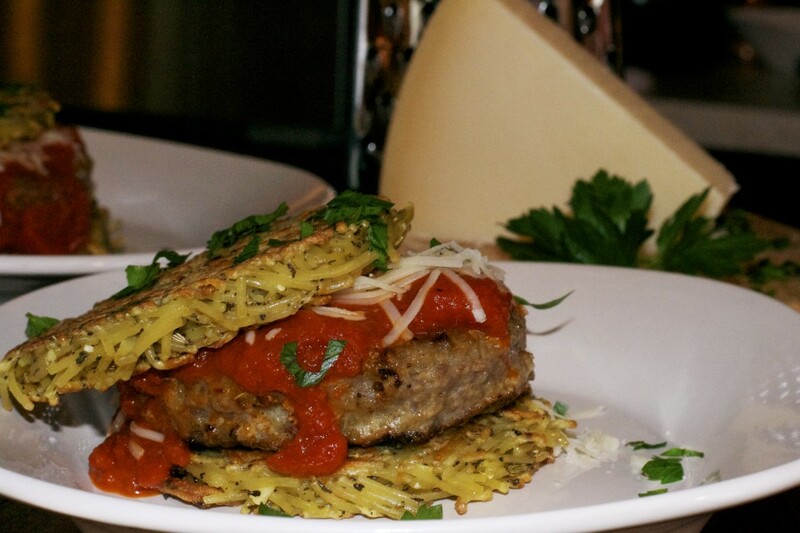 Place each meatball burger on a spaghetti bun and top with Marinara sauce and a sprinkle of Parmesan cheese. Top with second spaghetti bun and ENJOY! Note: I used a cut spaghetti called Fideo, I found it easier to handle and shape.